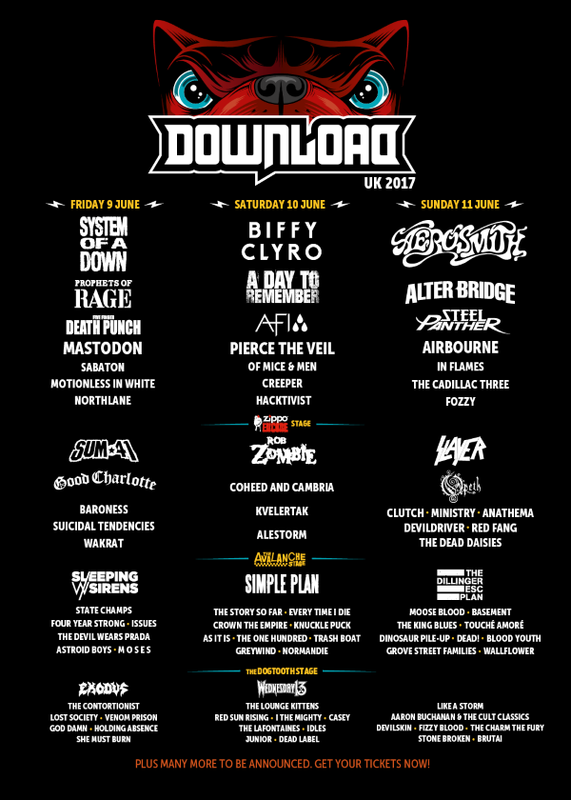 Download Festival 2017 Add 48 More Bands To Line Up!! As far as festival announcements go, you don’t get much bigger than this. 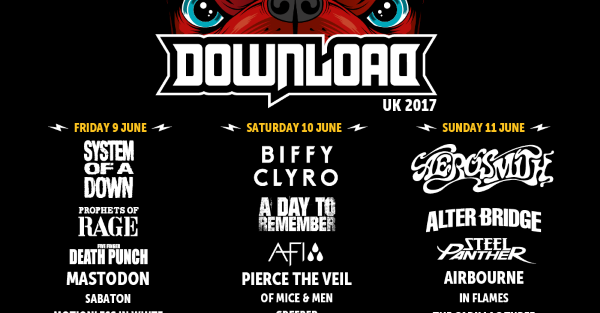 The 2017 Download Festival have only gone and added a whopping FORTY EIGHT bands to the line up for this years’ event. There are some huge bands in this announcement so it’s tough to know where to start, but a good place would be with Florida pop metallers A Day To Remember! Following their very successful first UK arena tour (including their fantastic show at Wembley Arena which has been covered here at Rock Sins), Download are delighted to have A Day To Remember return as special guests to Biffy Clyro on the main stage on Saturday for their biggest slot of their several appearances so far to date. Also returning to the main stage in a high profile slot are glam comedy metallers Steel Panther, who will again team up with Aerosmith and Steel Panther on the Sunday. 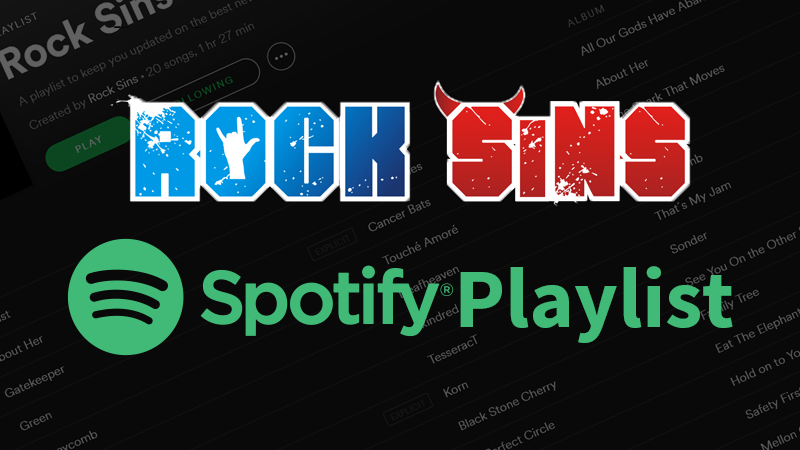 Their friends on Sunday will be Gothenburg natives In Flames, who once again impressed the UK on Avenged Sevenfold’s recent UK tour where they opened the show. The Dillinger Escape Plan’s last UK tour a couple of weeks ago proved to be the chaotic whirlwind everyone expected, but such has been the clamour for them to return, they are back to do it one last time in the UK. Download 2017 will be The Dillinger Escape Plan’s last ever UK performance, as they headline the newly christened Avalanche Stage (formerly the Pepsi Max tent). Emo stars of tomorrow (or perhaps very soon, judging by the hype around their debut album) and Southampton natives, Creeper will make their Download Festival main stage debut in 2017. They’ll be joined by fellow Brits, grime metal crossover favourites Hacktivist. All of the above bands will join headliners System Of A Down, Biffy Clyro and Aerosmith (in their last ever UK appearance) plus the likes of Prophets Of Rage, Alter Bridge, AFI, Five Finger Death Punch, Sum 41, Slayer and many more at the 2017 Download Festival at Donington Park on the 9th – 11th of June (campsite opens June 7th). For all your ticket needs and further information please visit the official festival website at www.downloadfestival.co.uk/tickets. We’ll have plenty more on Download 2017 as we count down the next four months so stay tuned!